Athletes know that to succeed on the field, you have to take care of your body. Many athletes find themselves at sports injury prevention centers to build their muscles and learn how to exercise properly, but what they don’t realize is that many sports injury prevention facilities turn to artificial athletic turf for its resilience and ability to absorb impact. SYNLawn Kansas City offers various artificial athletic sports turf and lawns in Kansas City and Missouri. How does athletic turf compare to natural turf? “Studies have provided strong evidence for comparable rates of injury between new generation artificial turfs and natural turfs,” a 2011 review in Sports Medicine concluded. Jan Ekstrand, vice-chairman of the European soccer Medical Committee (UEFA) said in a 2014 FIFA interview, “The new generation coming from the academies will be used to playing on football turf.” That same interview confirmed there was no difference in leg burn injuries caused by tackles whether players were on artificial athletic turf or natural grass turf. Injury recovery times also showed no difference, meaning players are just as likely to heal and get back to the game on synthetic turf as they are on any other surface. How is this possible? Modern artificial turf has evolved beyond infill-laden models of the past. Rigorous testing and strict production requirements allow SYNLawn Kansas City to offer some of the most realistic artificial grass on the market today. Whether it’s artificial turf for residential homes or sports turf for professional-grade gyms, SYNLawn artificial grass is able to meet the demands of a growing demand. Other realistic artificial grass options include TrackTurf, SYNPlay G60, SYNLawn Precision Putt, SYNLawn Classic Putt, SYNLawn Classic Pitch, SYNBermuda 211, and SYNTipede 214, all designed for different uses and purposes. 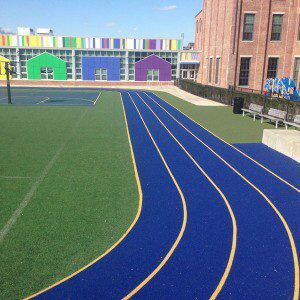 SYNPlay G60 is designed to be a lightweight playground turf whereas TrackTurf is built to withstand agility and cross training practices by professional athletes. Train like a professional athlete and invest in SYNLawn Kansas City’s athletic sports turf today!